I Love You More Than Carrots: Now You Can Have a Wishes Ornament, Too! 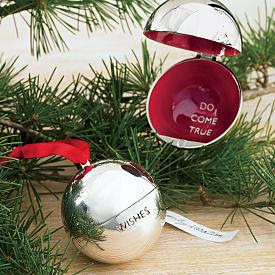 So many of you inquired as to where you could find a "Wishes" ornament for yourself, for your friends, for family, etc. Well, wonder no more! It truly does make the perfect gift and it's so stinking adorable, too! Head on over to Red Envelope right this second and scoop one up! I love Red Envelope. Always a go to place for a unique but classy gift. Oh thank you sooo much!!!! Thank you for finding it! I'm so excited! Red Envelope is the best! !